In its first quarter results for 2019, Apple revealed it had seen a considerable drop in iPhone revenue in Greater China, accounting for "all of our revenue shortfall to our guidance and for much more than our entire year-over-year revenue decline." For Greater China alone, revenue dropped 26.7 percent year-on-year from $18 billion for the quarter in 2018, down to $13.17 billion. The reduced demand for iPhones has led to a cut in orders from Apple to suppliers, which a Friday report by the South China Morning Post reveals is affecting the assembly partner's workforce at its plant in China's Henan province. The facility, measuring 15 million square feet in size, is one of 45 factories across China but is the biggest it uses for iPhone assembly. The cut orders has led to a reduction of benefits for those working for Foxconn, including the closure of a shuttle bus service running between the facility and worker dormitories, forcing many to spend 40 minutes a day walking before and after work. While the service is regularly cut during the Lunar New Year holiday before resuming once production reverts to normal levels, it is noted to have cut far earlier than normal. Smaller perks of employment are also being withdrawn by Foxconn, such as the free laundry service. Out of the 2,000 yuan ($300) to 3,000 yuan per month employees are paid, they now have to pay 7 yuan ($1) to do laundry, or pay 18 yuan ($2.70) to dry clean an overcoat. The salaries are also being affected by the reduction in iPhone orders, with tens of workers advising to the report they had their salaries cut at the end of last year, an unusual move by the company. The Foxconn workers are also paid far less than others in the city of Zhengzhou, receiving a basic salary of 2,100 yuan ($314) per month before deductions, which falls to roughly 1,500 yuan after mandatory deductions, tax, and pension payments. By contrast, the average worker salary for the city in 2018 was 6,929 yuan ($1,035) per month. Reports Foxconn axed some 50,000 seasonal workers since October were not entirely true, today's report claims, with most workers said to have resigned from the company due to a lack of overtime opportunities, again caused through reduced production requirements. Workers reportedly queued up to fill out paperwork to leave the company every day. Sources also advised the already-high turnover rate at the plant was much higher than usual at the end of 2018. One worker noted one line that would normally have more than 140 people on it during peak season was staffed by fewer than 30 employees. Following the mass layoff reports, in January Foxconn claimed it would be hiring 50,000 more workers across all of its Chinese factories in the first quarter. The changes affecting its workers are likely to have been prompted by Foxconn's efforts to cut $2.9 billion in expenses across 2019, a memo in November revealed. Citing a "very difficult and competitive year," the cuts would involve reductions in staffing costs for non-technical workers, along with other expense reductions. While Foxconn does perform production duties for many firms, including Microsoft, Amazon, Nintendo, Google, Huawei, and other major names, it is believed that Apple accounts for around 45 percent of Foxconn's overall business. While it is relatively insulated from sudden production changes from its other clients, the sheer size of Apple's custom makes it harder for Foxconn to negate such reductions. “culling”, in this case sacking, otherwise (animals) killing. This is supposed to be news? The sad part is, employees who work on Apple products get treated better and make more money. Android morons believe Apple owns Foxconn and they are Apples "slave labor". Conveniently leaving out the iKnockoffs made there with employees fighting to work for Apple instead, and Apple being the only company to yearly audit work conditions. iKnockoff users want Apple to crash and burn, which ironically would mean these "slaves" would be treated worse and get paid less. 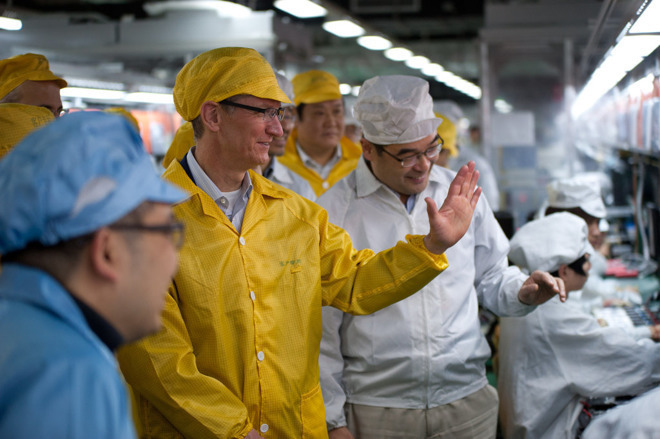 Foxconn’s issues are not Apple’s... thank goodness. $314 per month is abysmal if that's for full-time hours. I don't think that satisfies Apple's minimum requirements? If this is true, I feel guilty using my iPhone. But what is the solution? Increased production costs means increased price of products, and they're already costly enough. The real question is: how much is Apple paying Foxconn per iPhone?